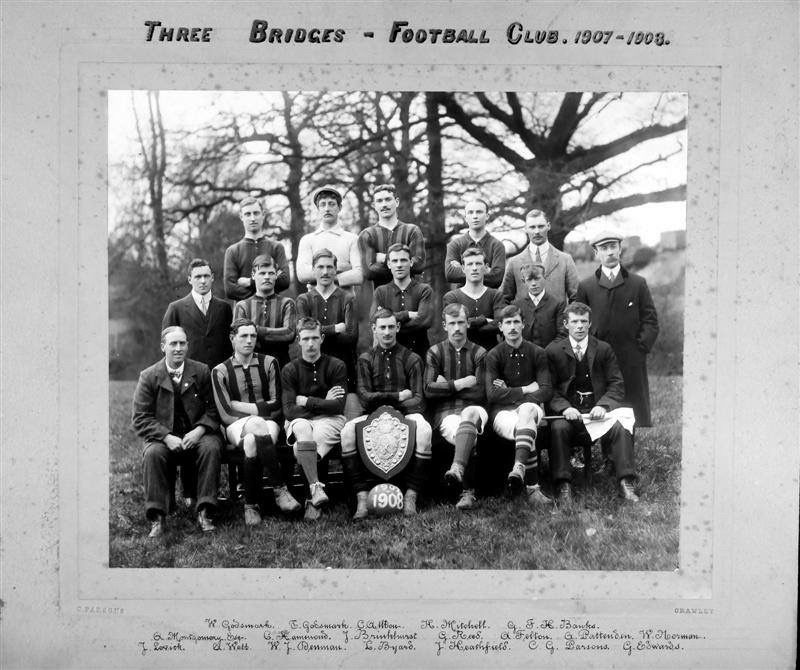 Founded in 1901, Three Bridges joined the Mid Sussex Football League in 1902 and were Champions of that League for the first time in the 1907/08 season. Their first major success came in 1933/34, when they won the Sussex Junior Cup, and sundry other minor honours came their way before they joined the Sussex County Football League in 1952/53, and two years later were crowned Second Division Champions. In 1962/63 they won the Division Two Invitation Cup and in 1968/69, 1973/74 and 1979/80 were Second Division Runners Up. 1970/71 produced an 'against the odds' triumph when winning the League’s Invitation Cup against Southwick (3-2). The 1980’s heralded a run of successes, starting with reaching the last 16 of the FA Vase for the first time in 1981/82 before losing at Molesey (1-2). A season later they made it to the last 32 but also won the Sussex RUR Charity Cup for the first time, beating Hastings Town 3-2. Another year on saw them finish runners up in the Thorn EMI National six-a-side tournament, winning a set of floodlights. 1985/86 saw them finish as County League Division One runners up, a feat they repeated in both 1987/88 (when they also won the RUR Cup again) and 1988/89. A fire destroyed their clubhouse in 1993 which re-focused their priorities and ultimately resulted in relegation in 1996/97. They won the Division 2 League Cup a season later and then finished runners up in Division 2 to regain Division 1 status. They were RUR Cup runners up in 2003/04 and then winners of that same prestigious trophy in 2007/08. In season 2010/11 hopes were high when they started by winning their first nine League games, but eventually finished the season in 5th place. However, they did win the John O’Hara League Challenge Cup for the first time that season, beating Rye United 2-1, a tremendous feat that they achieved again in 2011/12, this time AFC Uckfield being defeated 2-1. It looked like being another tough League campaign when they lost four of the first nine matches, but then lost only one of the remaining 29 games, which was concluded by beating Championship rivals Rye United 1-0 at home on the final day of the season! This tremendous run meant the club had achieved its ambition and become Sussex County Football League Champions. With a superb run in the FA Vase too, losing in the last 32 on a penalty shoot out with Derbyshire side, Gresley FC, the 2011/12 ‘Double’ season had undoubtedly been the best in Three Bridges’ history. Their first season in the Ryman Isthmian Football League South Division saw them struggle for much of the time. However, having been 10 points adrift at the bottom of the table in mid-February, they went on a run of 11 matches that produced 7 victories, 2 draws and just 2 defeats, earning them Team of the Month Awards in both March and April as a result. It meant that they survived the drop, but their second season in the Ryman League saw them struggle at times again but some key signings midway through the season helped them to 19th place. The 2014/15 season saw an even greater improvement with a healthy mixture of youth and experience guiding them into 7th position and, whilst they were happy to score 94 League goals, they were less than happy about the 95 they conceded! They improved their defensive record in conceding 67 goals in season 2015/16 but only scored 59, hardly helped by long-term injuries to strike partners Allan Tait and Tony Garrod. With 66 points, they slumped to 14th position, although they only accumulated 6 points fewer than in the previous campaign! Bridges maintained most of that season's squad for the 2016/17 campaign. However, with at least 11 first team players out injured by September, they had to use a lot of the U21s, Academy and U18s players and by November had lost 12 games in a row, drew three and won just one game. Towards the end of the season, they strengthened the squad but it was too late to avoid relegation. For this 2017/18 season, Bridges have kept the best of the players from last season and strengthened the team with more experienced players in the hope of promotion once again. Having dispensed with the services of Simon Wormull, Paul Hammond and Danny Lee from the coaching team, Bridges have also strengthened the management team with the additions of the experienced ex-Bridges player, Martin Dynan, and UEFA ‘A’ licensed Coach, Mark Wardley. Meanwhile, Bridges have retained the U18s team in the Isthmian Youth League and the U21s will play in the SCFL U21s West Division, while they have folded the Academy team.